Don't worry, I got you!!! 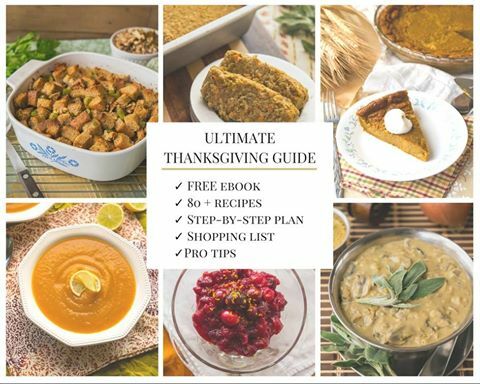 First, download my step-by-step game plan, full menu, RECIPES, and expert tips in my ultra useful FREE Thanksgiving ebook. Get it right here and gobble up ALL THE ZEN! There's also TWO videos! !Including one of me cooking 6/8 courses (basically everything but the pie and cranberry sauce!) in 30 minutes. A: Most folks don’t know what “plant-based” means. Heck, most folks still offer chicken and fish to vegetarians! You’ll need to be super specific, listing off exactly what you do not eat. I like to include a quick description of foods we DO eat to help the host, especially if they are totally foreign to our dietary needs. After seeing the list of “Do nots” they might be wondering what on earth you can eat, so seeing the “do” list helps them. You can also send a few recipes from the eBook to the host. Q: "How to not let the judgement affect you?" Uncool to admit this, but: the judgement isn’t going to NOT affect you. It hurts. Overtime you start to be less sensitive to it, but there’s always still a little bit of discomfort, even for a 10-year vegan like me. Instead of exhausting your energy trying (unsuccessfully) to let it NOT bother you, accept that it will and focus on what you’re going to do about it. Think about what people might say and what you can diplomatically say back to them. Notice I didn’t say conjure up a clever “comeback” because the holidays aren’t really a time to draw swords. Ain’t nobody’s mind gonna be changing right there so don’t waste your breath. Also remember whatever someone says about you, says a lot more about them. By passing judgment on YOU, they’re unveiling their insecurity. It’s not your job or duty to defend or explain yourself to anyone. I welcome honest curiosity but I refuse to live in a defensive position. I don’t ask my family and friends to explain or justify their diets or lifestyle choices and expect the same respect in return. FOMO is real and I get that. I like to remind myself that I’m not there for the food. That’s not to say I don’t love or enjoy my meal, I do, but I remind myself the day is about gratitude and spending my time with those I hold most dear. Live life for the experiences because those are the memories we relish. (We rarely remember the food we eat socially but we remember the socialization). I also like to ask myself: is eating foods that I normally wouldn’t, foods that are going to make me feel bloated or crappy, how I can “treat” myself well? I’m always so much happier when I stay committed to myself and my goals. It’s not always easy, but the momentary pleasure I might experience is never worth the fall out afterwards. Remember: There’s two sides of deprivation. There is depriving yourself of the thing you “want” and then what you deprive yourself of by having the thing. For example, I can deprive myself of a second cocktail, or I can have the second cocktail and deprive myself of feeling 100% the following day because I’ll have a slight hangover. Likewise, I can deprive myself of a seconds, or I can have seconds and feel uncomfortable all night afterwards from overeating. Most people don’t really care if you eat the food or not. They just want acknowledgement of their efforts and to feel appreciated, which you can give with your words. Their being offended also doesn’t mean they don’t care about you (they do) they just care more about their ego in that moment, which is why you shouldn’t sacrifice yourself. Don’t divert from your moral compass for the sake of someone else’s feelings — their feelings do not supersede yours. It’s okay to hurt someone else’s feelings, just apologize if you do. Now, I know what you’re thinking: your mom or aunt Sue, or brother-in-law is different. They hold grudges and never let things go... but even those types tend to forget by the next day and even if they DO remember, they’re over it by next week and if they aren’t? That’s not your problem. Q: "Any suggestions for the most omni-friendly Thanksgiving dish?" Serve anything that’s familiar and isn’t pretending to be something else. This means bring butternut soup or something like acorn squash stuffed with rice, walnuts, and cranberries. These foods may not be “weird” to you, but they definitely are to most omnivores. You’ll have better success if you feed them something they recognize, know, and already like. Since some omni’s can also be weird around beans and lentils, I tend to stick to vegetables and whole grains, or pasta if they’re really not adventurous eaters. "I cook for my family and in-laws but only two people are vegan. I WANT to make vegan food but I feel compelled to please my husband and his father, who expect a “traditional” meal. What do I do?" You have to compromise and what that might look like is different for every family, but just make sure YOU are not the only one compromising. Most of the traditional dishes can be made vegan without much disruption to the family recipe. For example you can use vegetable broth instead of turkey broth in a gravy, Earth Balance (or other vegan margarine) instead of butter on the vegetables, soy milk instead of milk. Over time, your family might also change their own preferences and expectations, too, if you open them up to new possibilities. For example, my parents spend every Thanksgiving with my cousins and aunt, all of whom are omnivores. My cousin (the host) offered to set aside some of the vegetables for my parents before tossing them with butter and cheese. Knowing this, my parents brought my mushroom gravy with them, plus a vegan pumpkin pie to share. There wasn’t any pie left (no surprise!) but two of my cousins were curious about the gravy and asked if they could try it. “Mmm wow that’s really good!” they said, so the next year, my mom doubled the recipe in case anyone wanted extras. No leftovers! The following year my cousin specifically asked my mom to bring her gravy (“everyone loves it”) and the pot was licked clean while the traditional turkey gravy remained largely untouched. Now, my cousin doesn’t even bother making her turkey gravy anymore. Only my mom’s gravy --- the VEGAN gravy -- is served at Thanksgiving. My cousins, by the way, deep fry their turkey. Not bake it -- deep fry it. So I say with zero hesitation that they aren’t even a little bit vegan :) Yet their minds changed and their preferences shifted. Q: "My stress/concern is that apparently I am already supposed to be at some magically thin place because I am vegan. “Gosh, you’re the biggest vegetarian I have ever met” was said once. What can I do?" P.s. I’m so sorry that happened to you! How AWFUL! Q: "My mom is a food pusher. I think she wants to connect with me but she uses food to try to do it." You’re absolutely right. Most food pushers are coming from a place of love. Some aren't and how you handle those people is totally different, but with the well meaning family (like your mama), let mom know you love and appreciate her, and reassure her that you have a good relationship and you are connected. You can also tell her other ways she can please you and reinforce when she does those things. For example, my mom loves to buy me socks (of all things) so I tell her "I'm wearing those socks you bought me!" and I even text pictures of me wearing them sometimes. Q: "Help with after the holidays getting back on track." If you’re a member of meal mentor, you can do the 3-day refresh, a mini “detox” meal plan (it’s available to all members on your dashboard). The refresh is a fantastic way to get yourself back on track after too many sweets, drinks, and massive holiday meals! So if you need a POWER reboot post-festivities, this mini meal plan is the ticket! The members and I are also doing a full 7-day reboot TOGETHER in January to start 2017 right! Stay tuned for more deets on that! We're having our FINAL blowout sale on Cyber Monday! ONE DAY ONLY! Join on Cyber Monday and pay only 14.2% of the full value. That’s right! As an annual VIP member, you’ll enjoy a whopping 85.8% savings! You can also join NOW, get started immediately and upgrade at a lower price on Cyber Monday.